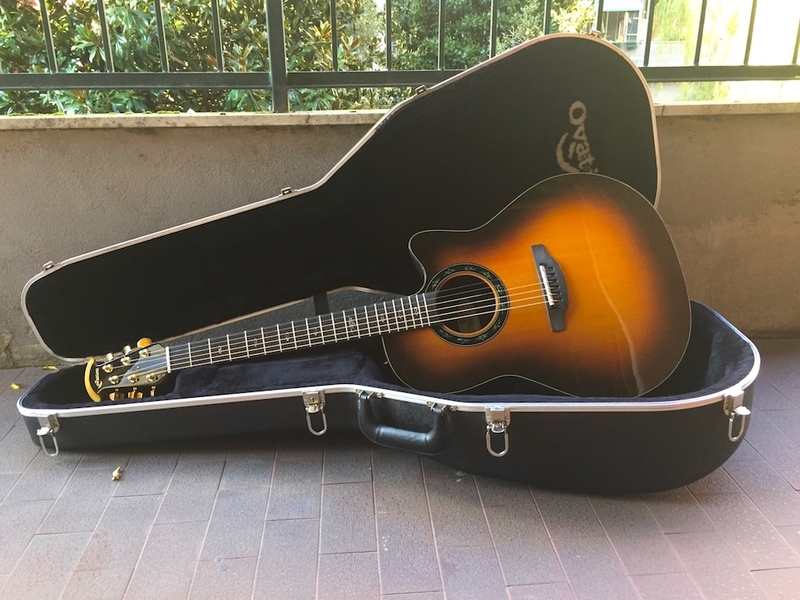 I love Ovation guitars because they look, play and sound good, but I also love them because you can buy a superfancy Ovation (as this 1617 ALE-1) at a fraction of the price of a Martin or Collings: they bring an awesome value for money. Always enchanted by the 1617 ALE-1 (ALE = Adirondack Legend), I never found one at a reasonable price (well, after all is a fancy guitar limited to 50 pieces, representing the swansong of the FMI-Ovation, so the owners tend to keep it). In November 2016 I saw one for sale in Rome at a realistic price, made an even lower offer and found an agreement. The ALE has a structure and ornamentation similar to the 2009 FKOA: tortoise binding, scalloped X bracing, the beautiful abalone inlaid rosette with the Celtic infinity pattern, premium grade ebony fretboard with abalone infinity inlays. The selected exquisite adirondack top is finished in a wonderful sunburst while the neck is solid maple with gold Schaller tuners. The new logo enriches the classic design headstock, that looks beautiful thanks to the contrast of the natural maple with the black veneer. The bowl has the original deep profile and is made with the old-style layered Lyracord (no microspheres and no compression here) for that vintage Ovation tone, with lots of ring and clear mids. In fact, stringed with the 12-54 Martin Clapton strings, the 1617 ALE-1 is the clearest and best ringing guitar in my collection. The low profile pickup and and OP-PRO pre-amp complete the pack of a dead mint, great looking guitar. A beautiful and fancy Legend, that can be considered one of the last iconic guitar made in New Harford by the original team of luthiers. Grazie Luciano!